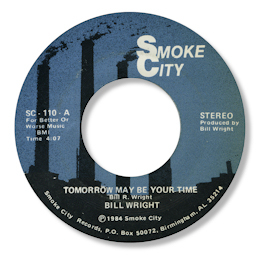 Bill Wright was a talented southern soul singer who recorded a good few titles, all of them well worth hearing, but apart from the famous “A Man In Love” his career hasn’t really attracted the sort of attention his light high baritone vocals and songwriting skills deserved. Partly this is due I think to the fact that his records were released in the 70s and 80s well after the golden age of southern soul, and partly to the sheer rarity of his output which has meant that his sides simply haven’t had enough exposure. He recorded in Birmingham, AL most of the time, and his work in the 70s was heavily intertwined with guitarist and singer Richard Marks. 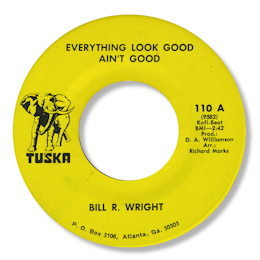 Marks and Wright co-wrote all four of the tracks that appeared on Atlanta, GA labels Note and Tragar, and Marks is no doubt the session guitarist on them as well. The funky “How Can I Hit The Ball” is good, and the frantic screamer “You Got A Spell On Me” is high class southern soul as well. But best of all of these cuts for me is the tuneful, gospel based ballad You’re The Only Thing I’ve Got Going For Me, which has a soul stirring Wright performance. Around this time too he recorded the rhythmic “Everything Look Good Ain’t Good” for the fabled Tuska label, and this is my personal favourite of all of his funk tracks. 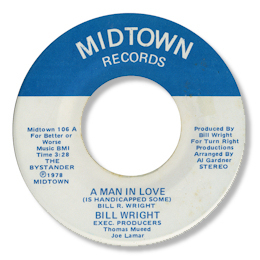 At the end of the 70s Wright had a few 45s on the Birmingham label Midtown. The first of these was A Man In Love, surely one the best 45s for 1978. Melodic, atmospheric, and beautifully arranged by Al Gardner this cream cut fully deserves all the plaudits it has been given. The flip, “Innocent Bystander” is a fine slab of mid paced southern soul, which was also cut by Marks. A tasty (improved) recut of “Everything Look Good”, featuring some wicked horn lines, formed the flip to the uptempo “You Can’t Let Your Left Hand Know”. 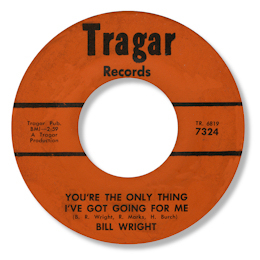 Wright’s final two self-produced releases started with the hard hitting – bitter even – social comment “The Free And The Brave” which was billed as coming from a forthcoming LP “You Can Take Me Out Of The Country” but sadly this never materialised. His final 45 reprised “You Can’t Let Your Left Hand Know” as the B side to another fine ballad Tomorrow May Be Your Time. This is a good showcase for his vocal approach – and the synths are thankfully well muted. Note ~ You can find "You Got A Spell On Me" and "You're The Only Thing I Got Going For Me" on the excellent Numero Uno double CD "The Tragar And Note Labels".